I have always loved seeing window boxes on houses. They just add so much design and beauty to your windows and can really improve your curb appeal. 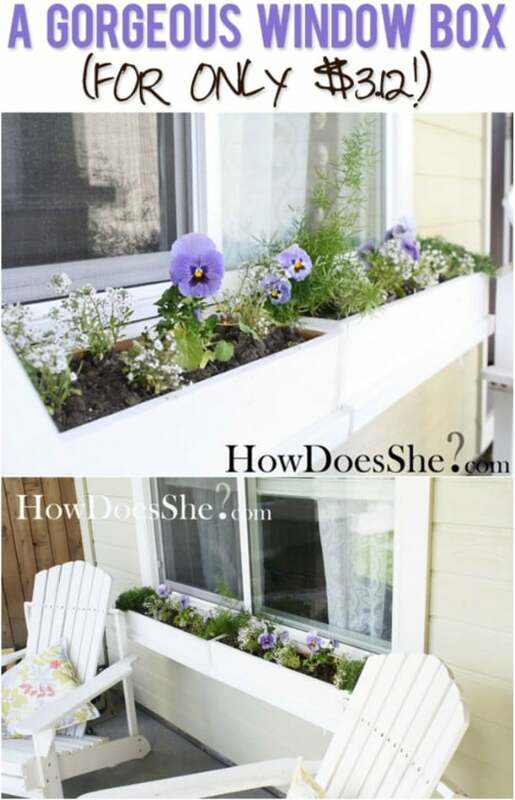 If you have always loved them too and you want to add some window boxes to your home, I have a wonderful list of 20 DIY window boxes that are all really cheap and easy to make. You could buy window boxes at any home improvement store but you’re going to pay about $50 to $100 for a good one. 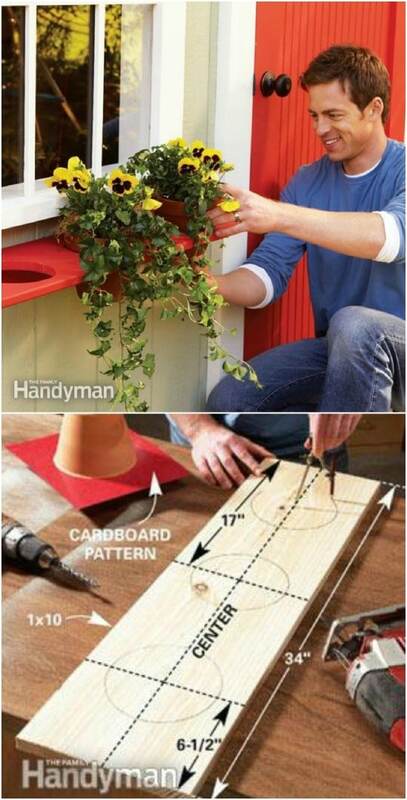 You can DIY a window box for much less. Whether you put real plants or silk flowers in your window box, this is a wonderful way to add some beauty to your home. You can also use window boxes to grow succulents and herbs and give yourself a bit more space to grow things, which is really helpful if you don’t necessarily have a lot of gardening space. Just imagine growing beautiful flowers right there under your windows. Not only does this give you color and beauty on the outside, but you will see these gorgeous flowers every time you open your windows. And, you can add even more beauty to your home with these 40 easy one day lawn and garden DIY projects. 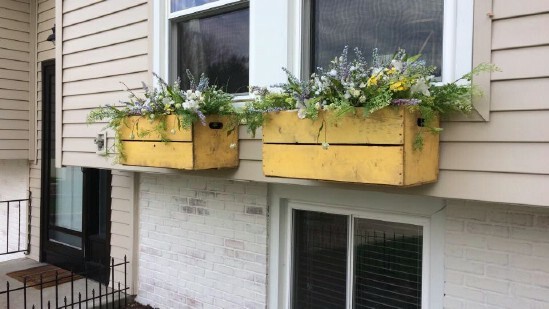 Flower boxes are so much easier to make than you may have thought and you can make many of these with repurposed or upcycled materials, which means that they are also really cheap. 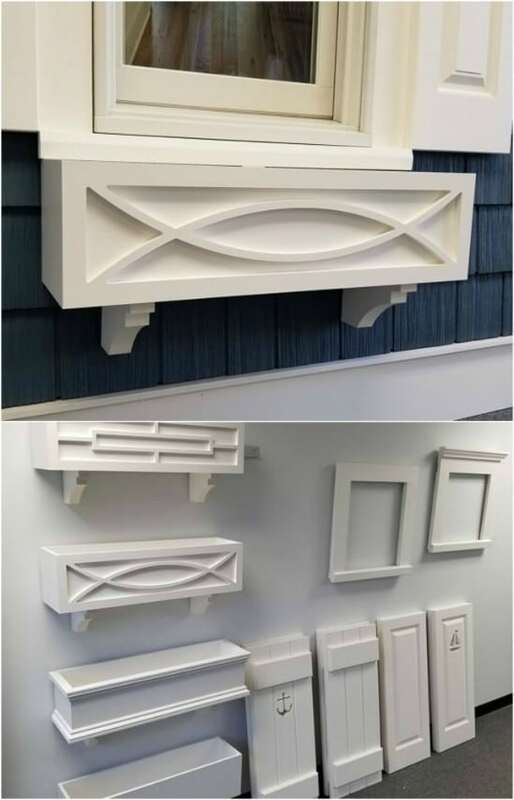 Whether you want a traditional wooden window box or you prefer something make of plastic, you are going to find the perfect DIY project to add beauty to your home. DIY window boxes are the perfect way to add that extra touch to your outdoor décor, and be sure to also check out these 10 DIY butterfly feeders that will bring gorgeous butterflies to your garden this spring and summer. 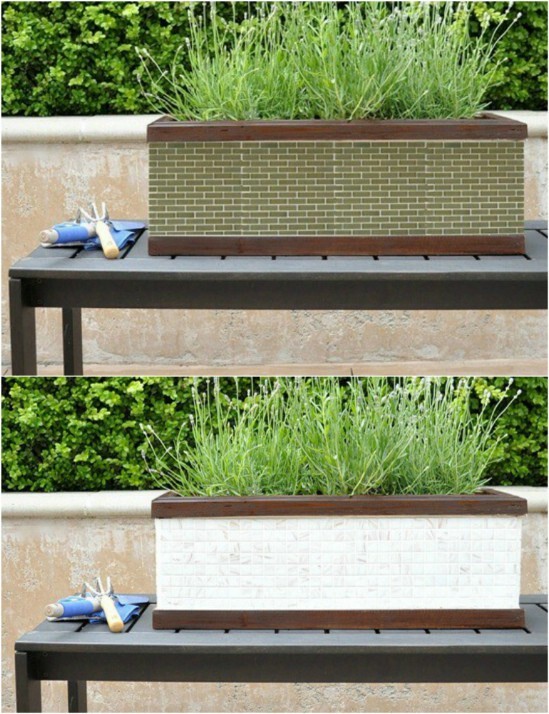 If you want a window box that is really cheap and really easy to DIY, this one is it. You make this with wood, that only costs a little over a dollar per board, and it only takes about half an hour to make one. You could add one to every window on your house for less than $100 – depending of course on how many windows you have. This DIY window box is made from an old window and it is perfect if you want to add a bit of rustic flair to your home’s exterior. This one is really easy to make and it is the perfect way to repurpose old windows. 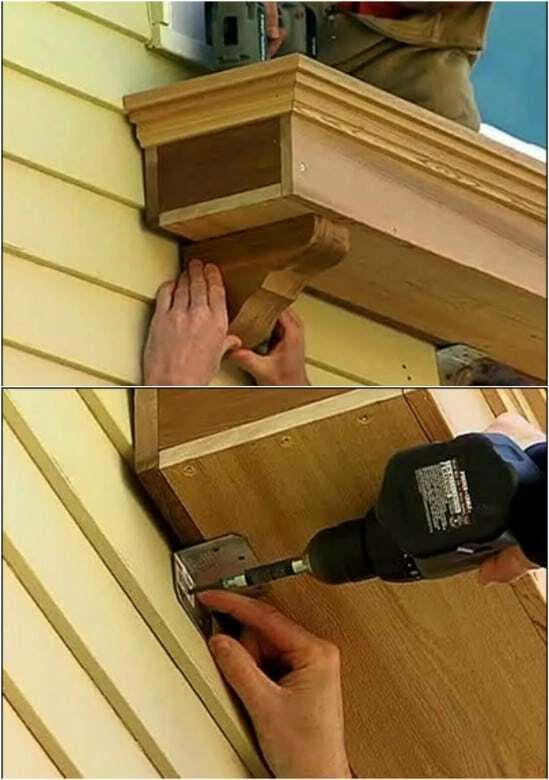 If you have a few old wooden windows on hand, this window box won’t cost you anything and it doesn’t take long at all to DIY. This window box is covered in cedar, which gives it a lovely look. 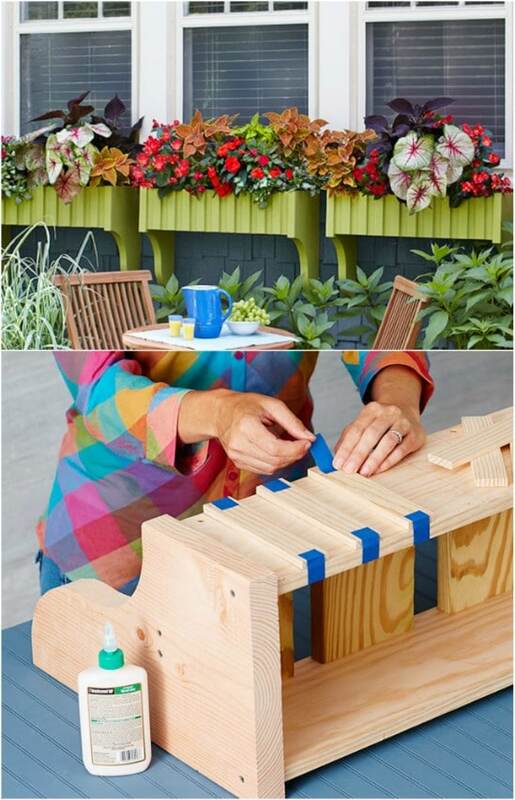 You make this one by layering cedar boards – which are pretty inexpensive – over a traditional cheap plastic window box. The result is a really cheap and really easy DIY window box that will look really expensive and professionally made when it is finished. You can build window boxes for all of your windows – or at least the ones on the front of your house – in just one day with this DIY window box plan. You can use cedar or cypress boards for this one, which are both pretty cheap so this one is as inexpensive as it is easy to do. Paint it whatever color you need to match your existing outdoor décor and then add your favorite plants or flowers. 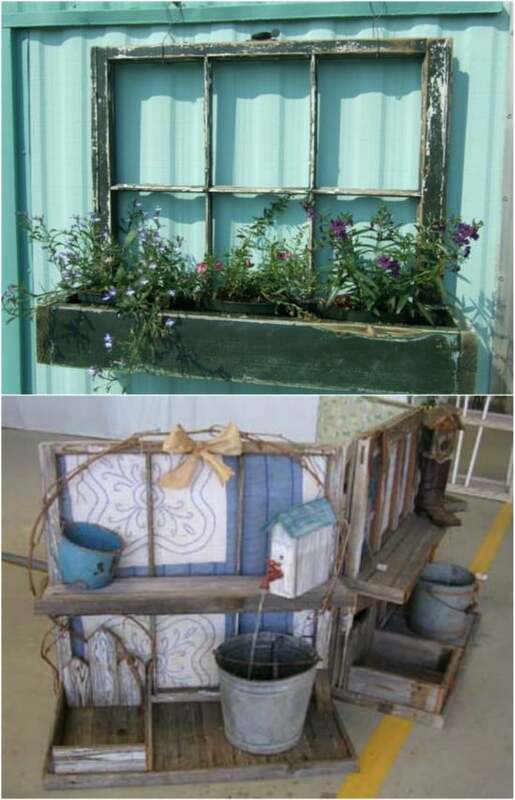 These gorgeous window boxes have a plank look that is perfect for adding a bit of rustic charm to your outdoors. These are really easy to make and won’t cost much. I love the wooden brackets that show on the bottom. It gives them such a nice old fashioned look and you can paint them any color that you want to match your outdoors. Take any old wooden door or a few old boards and turn them into this lovely rustic repurposed wood window box. This one is really easy and is perfect for creating a farmhouse look on the outside of your home. You don’t even have to paint these when they are finished, although you can add a bit of grey or white paint and then distress it with sandpaper if you really want a rustic look. I love the unique design of this DIY window box. Instead of a wide open section for your plants, this one has holes that you drop your planters into. 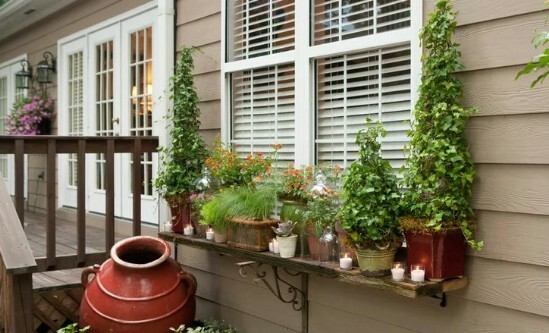 You can dress it up even more with your DIY garden pots or just add those regular terra cotta pots. You can even adjust the sizes of the holes if you need to in order to hold the planters that you want to use. 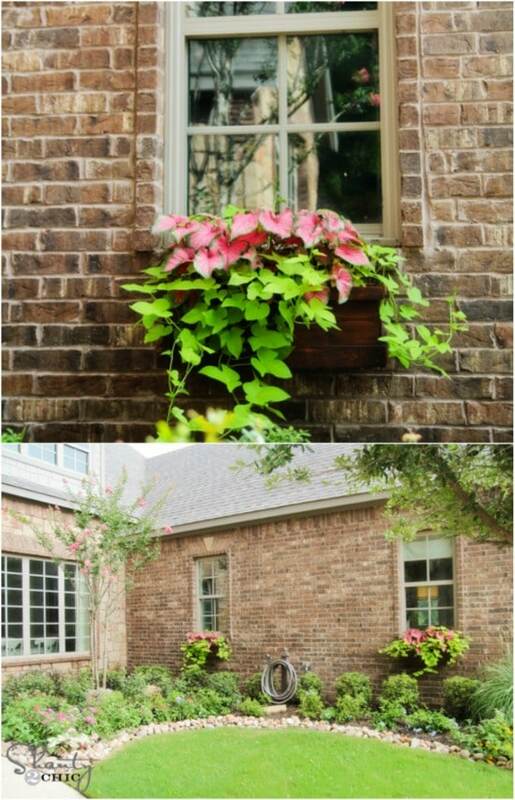 Take those old worn out gutters – when you replace them with new ones – and turn them into lovely window boxes. 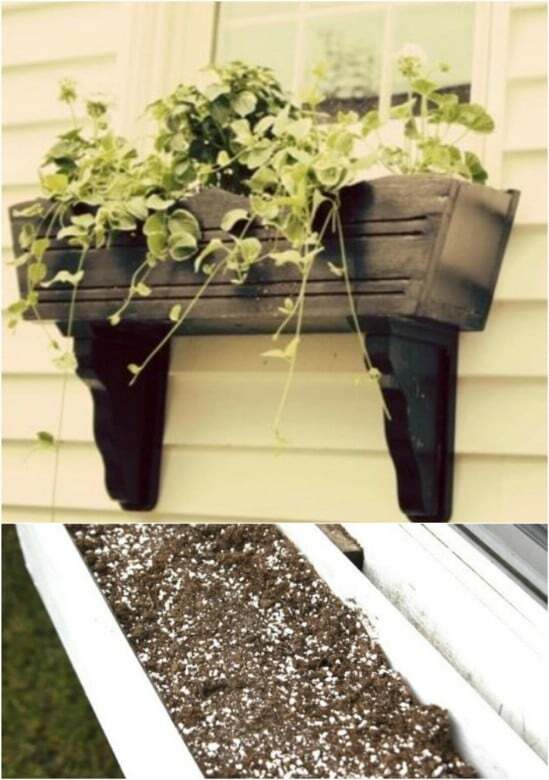 This one is super easy and really cheap if you have some old gutters to use. If you don’t have any gutters on hand, you can normally get mismatched ones for really cheap at discount hardware stores or check with friends and family who may be replacing their own gutters. 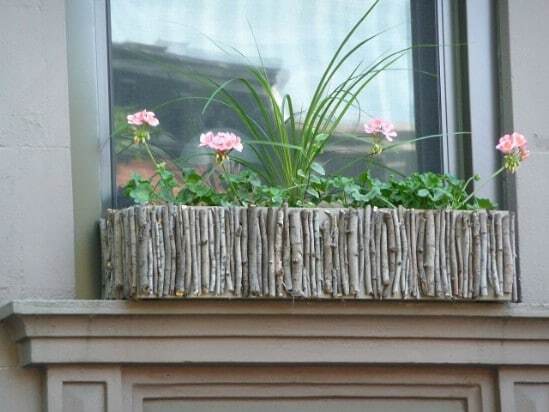 You have to love the rustic look of this plank pine window box. It’s gorgeous and perfect for adding some farmhouse flair to your home. Or, you could paint it a bright and vibrant color to give it a more contemporary look. However you choose to display it, this one is really easy to build and if you happen to have some pine boards available, it’s also really cheap. 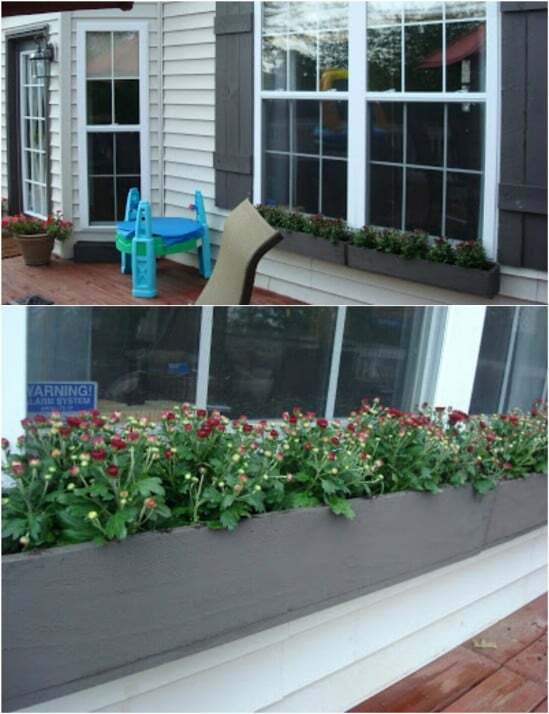 This wooden window box has a really traditional look to it and it is super easy to build. You will of course, need to have access to a few power tools. You can add the brackets or leave them off if you want something a bit less old world looking. I think the wooden brackets really make the look, though and they are really easy to do. 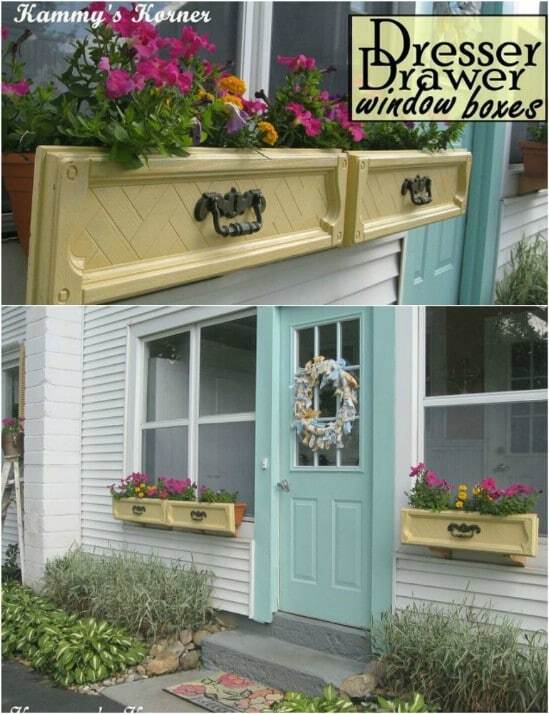 I love projects that use repurposed materials and this dresser drawer turned window box is fabulous. You don’t even have to build this one! It’s all done for you when you use an old dresser drawer to create the box. This is a wonderful way to repurpose old dressers. 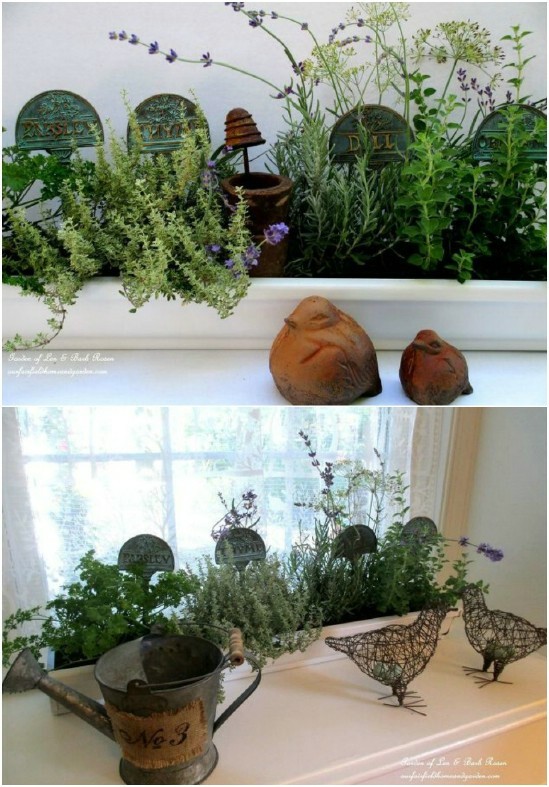 You will get as many window boxes as you have drawers and then you can use the base of the dresser for something else. Here is another beautiful window box that is made from pine and it is really decorative. You can find these wooden decorations at any home improvement store and then simply glue them onto your DIY window box. It gives the entire thing such a gorgeous look and the metal handles on the sides really makes this one look unique. It’s much easier to DIY than it looks. If you really want something unique and rustic, you can add these DIY twig window boxes to your home. These are super easy to make and so gorgeously farmhouse inspired. You just hot glue twigs to the outside of your plastic or wooden window box and you’re all set. This is a wonderful way to repurpose sticks and twigs into your home and garden décor and it’s perfect for that log cabin look. You don’t have to have a lot of woodworking skills to make this easy DIY wooden window planter. And, you don’t have to nail or screw it together. You make this one with wood glue and it stays perfectly in place and held together with the glue. This is such an easy one and you can use new or repurposed boards to create it. If you don’t want the traditional box shape of a window planter, you can simply add this DIY window shelf to the underneath of your windows and then fill it with potted plants. This one is one of the easiest ones that you can make and it will only take you a few minutes to make it. If you have an old shelf that you aren’t using – one that fits under your window – this could also be a really simple repurpose project. Succulents are great – they grow just about anywhere and they are perfect for adding a bit of color to your home. 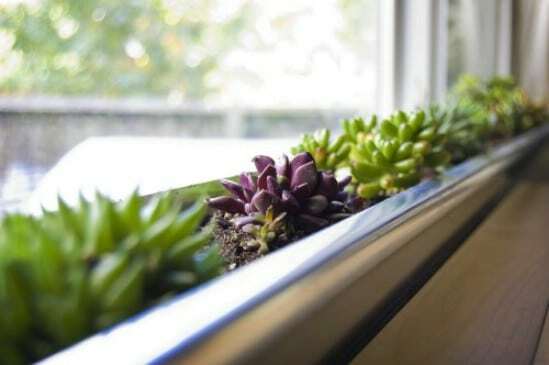 This DIY succulent window box is made from an old metal gutter and it is a really inexpensive and super easy one to make. Add succulents to every window on the front of your home for a really unique look that will instantly upgrade your curb appeal. If you want something really pretty and unique, this DIY mosaic window planter is a good one. 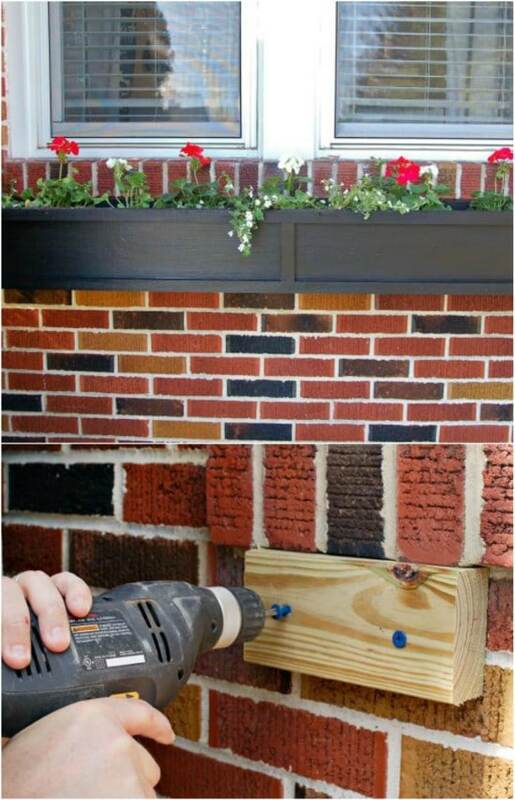 It’s pretty easy to do – you just add the mosaics over an existing wooden window planter. There are so many DIY mosaic projects that will add beauty to your home and garden and this is one of the simplest ways that you an add this look to your home. 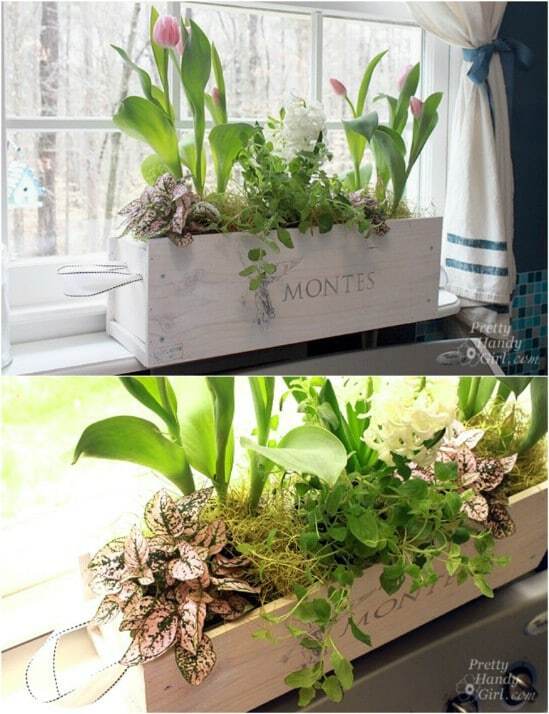 If you have an old wine crate that you can use, you can repurpose it into this gorgeous white washed window box. You don’t even have to have a crate on hand. Check with your local winery to see if they have any that they will sell. They won’t charge you much for them – or you could just build the wine crate yourself and then white wash it to get this beautiful look. 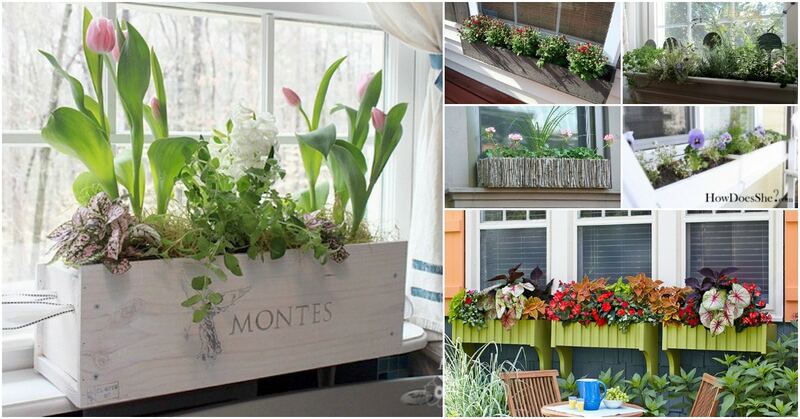 Wooden crates are perfect for repurposing into window boxes. The work is already done for you – you just have to decide how you are going to attach them to your house. You can either screw them directly under the windows or create brackets – or use metal shelf brackets. If you don’t have any wooden crates, you can buy them pretty cheap or make them yourself. I love the ingenuity of this PVC window box. It is made with PVC so you know that it will never buckle or warp. You can make this from PVC or you can just check out this one that is already made. I found this one on Etsy and it is all handmade and absolutely gorgeous. It’s just over $100 for one that is already done and it comes in a variety of sizes to fit your windows perfectly.